Our Santa with Sleigh Weathervane is truly an impressive garden decor accent, as well as a spectacular and durable outdoor decor item. Each unique weathervane design is hand crafted using 14 gauge steel and is laser cut in one piece, minimizing welding and proving a clean look with intricate detail. 1. Zinc Plating is applied on base metal for better adhesion, durability and rust prevention. 2. Copper Vein powder coat is baked on for a beautiful hammered copper look. 3. Clear Polyester powder coat is baked on to protect against UV rays and provide a durable, scratch resistant finish that also helps prevent fading. In addition to the extra durable finish, High Quality Sealed Ball Bearings allow the decorative windcups to spin freely in even the slightest breeze. 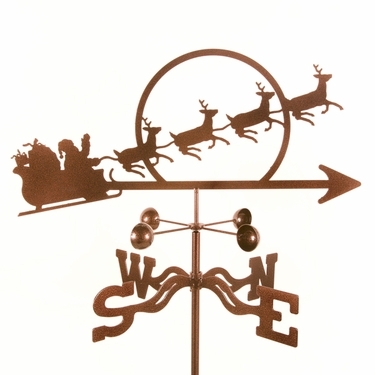 You will absolutely adore this Santa loving weathervane gardening gift! Our Steel Weathervanes look great when pole-mounted in the garden, but they are also perfectly suitable for mounting on any vertical post, attached to any horizontal surface like an outdoor deck railing, or roof-mounted on any home, garage, cottage, cabin, gazebo, cupola, barn or shed. For your convenience, this Santa with Sleigh Weathervane comes complete with your choice of garden, post, deck, or rooftop mounting hardware. All our weathervane tops are 21"W (arrow) and between 6" to 11" in height, depending on the design. All EZ Vane Weathervanes are proudly made in the USA and come with a one year warranty on the finish and a lifetime warranty on all workmanship. Express your passions, hobbies and interests while connecting with the winds of Mother Nature with this high-quality, decorative, and functional Santa with Sleigh Weathervane. Assembles easily in minutes, provides years of endless enjoyment, and makes a great garden gift too! Looking for even more Whimsical Weathervanes? Unique Santa with Sleigh Weathervane, 21"W (arrow). Hammered copper look, super easy assembly. Uses high-quality sealed ball bearings. Wind cups spin in the slightest breeze. Your choice of mounting option included. Express yourself with this great garden gift! 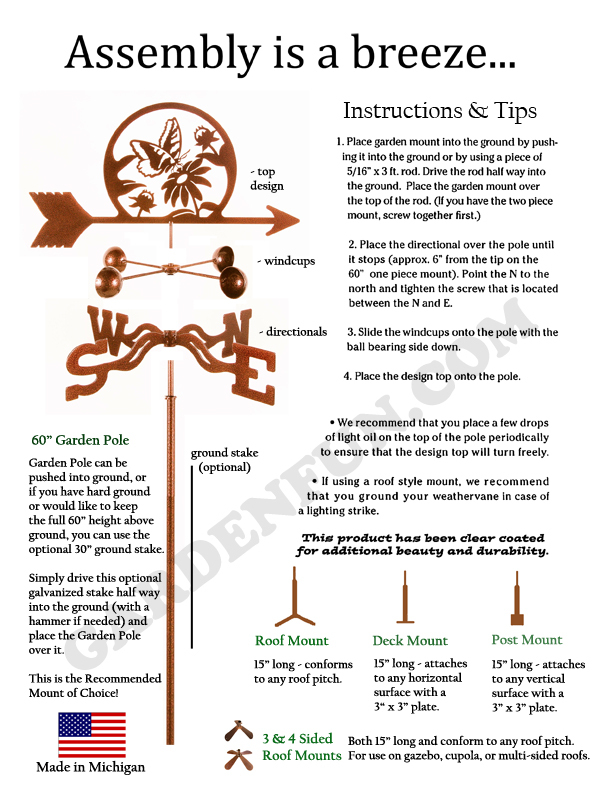 View Steel Weathervane Assembly Instructions Here!